Shangri-La Singapore celebrates the Year of the Boar extensively and across all of its dining outlets, including Shang Palace, The Line, and The Lobby Lounge. There’s even a special Chinese New Year’s Eve Reunion Gala Dinner held at the Island Ballroom, or you can indulge in the delectable fare by Executive Chinese Chef Mok Kit Keung at Shang Palace. A most definite highlight from the tasting menu we previewed is chef’s clever Crispy Suckling Pig with Preserved Bean Curd accompanied with Baked Foie Gras with Chicken Pastry. The suckling pig is perfectly crunchy and fatty, but what stood out even more is its Bo Luo Bao partner. That crust texture is rich and buttery, and with a satisfying crunch opens up to a dreamy chicken filling made creamy with foie gras. Another great dish is the Baked Cod Fillet with Seasonal Greens and Bean Crumb. An extra scrummy, spiced fried soy bean crust accentuates the sweet and tender white fish beneath. 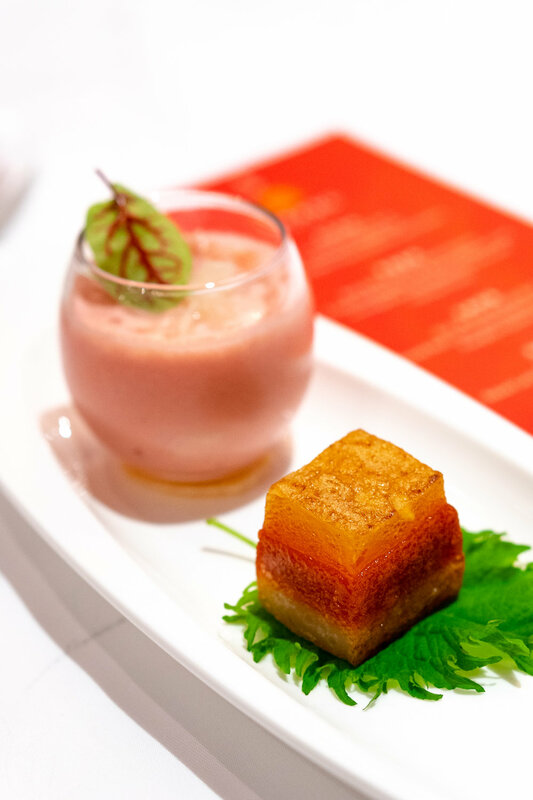 Dessert arrives in form of a wonderful melding of guava freshness (instead of mango) with the light citrus of pomelo. I also enjoyed how the Nian Gao is sandwiched between pan fried water chestnut cake that help balance out that denseness of sweet glutinous rice cake. Chinese New Year dining at Shang Palace, Shangri-La Singapore is available through 19 February 2019. For more information and/or reservations, please visit their website, call +65 6213 4398, email dining.sls@shangri-la.com.